Dinosaur Comics - April 23rd, 2012 - awesome fun times! 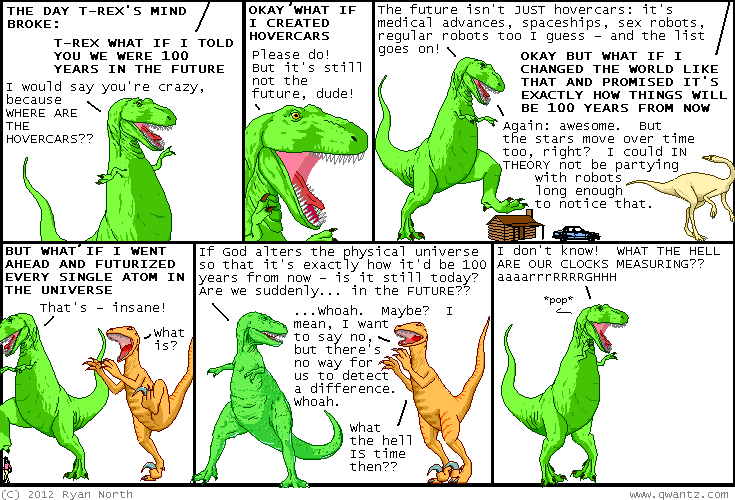 April 23rd, 2012: This comic was pretty directly inspired by Less Wrong's discussion of timeless physics, which I think you'll enjoy! If your mind is breaking, just tell yourself that time and space are related, and so by magically changing space you're also magically change time, even without intending to. Now you can continue going through your day! PHEW close call there huh? ?